Are you one to punch out or go for the green? How many times have you found yourself in the woods or behind a tree or obstacle? All golfers have faced this very situation from time to time and you basically have two choices, either 1) punch out into the fairway sacrificing distance or 2) curve the ball around the trees and up the fairway toward the green. The first option is always the safest route in most cases but the opportunity to be more aggressive is there as long as you understand what makes the ball curve and how to play the shot. The position of the clubface at impact is the determining factor on how much the ball will curve which makes the first thing that you have to do when attempting this shot is aim your clubface at the intended target. 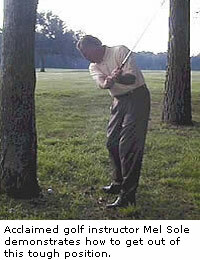 Secondly, align your body to the opening or the direction the ball will start and simply swing to the opening. If done correctly, the ball will fly past the tree or obstacle and curve to the target. Most golfers have had days when they hit the ball great on the practice tee and cant seem to get the same results on the golf course. This is due to poor practice habits and not making your practice match your course situation. Here are three tips on improving your practice in order to improve your scores. 1) Set up a practice station with two clubs for alignment and one for ball postion. 2) Play a game on the range - Imagine your toughest hole and play it in your mind. Hit your drive, second shot and chip or pitch according to how your shots were played. This will put added pressure on yourself and help you improve your pre-shot routine as well. It will also make your session more interesting and valuable. 3) Always practice to a target, if you aren't the time is wasted.